Is there any solution about how to use ETC compression in U3D? 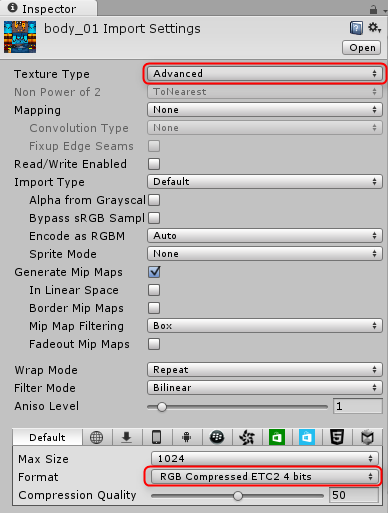 If you change the Texture type to Advanced, I think that it is possible ETC compression. ETC compression only support non alpha channel texture,as far as I know.So I had to divide the origin texture into two parts, texture without alpha and alpha sampling. And I can combine it using shader. It become many sets finally. I have no idea how to use this "sets" in my live2d model. Do you have any tips？A U3D demo will be better. Live2D shader files outside of the library file . However, even to modify the Live2D shaders it may not be resolved . Thanks! I will keep watching the offical update.